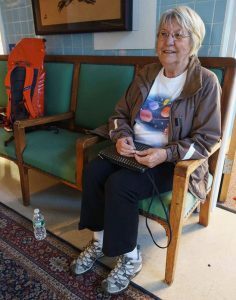 OGDENSBURG, N.Y. – Pam Boyle is waiting outside one of the old classrooms in the former Sherman Elementary School, now, Sherman Inn Bed and Breakfast. She sits there, relaxed and filled with anticipation for another yoga day. However, unlike any other yoga Tuesday, today is different. It is the 58th US Presidential election and she is worried. Boyle, a retired teacher and 30-year resident of Ogdensburg, is one of the seniors voting in this year’s election. According to the American Association of Retired Persons (AARP), if history will be the guiding factor, the majority of this year’s voters will be aged 50 and over. Further, these voters know from history that voting is the opportunity to voice and decide which direction the country takes. Boyle says she has been voting for years and she mentions how this year’s race scares her. “I am voting for Hillary… Donald Trump is one scary person and he is totally unqualified to be President of the United States,” she says. Boyle’s yoga classmate, Ravinder Agarwal, expresses a similar sentiment. Agarwal, a retired surgeon, is a supporter of President Barack Obama and believes that a Clinton win would mean the continuation of the policies he admires. Before heading to yoga Boyle smiles and jokes that before voting, she needs to relax and breathe.